"My mom's summer dessert! So easy and fast to make. 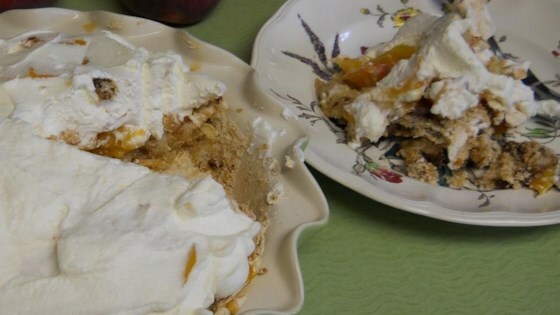 A vanilla meringue base with pecans is topped with sliced peaches and whipped cream. Make it early in the day; the longer the peaches sit on the crust the better!!!" In a large glass or metal bowl, whip the egg whites until they can hold a peak. Gradually sprinkle in the sugar, while continuing to whip the egg whites to stiff peaks. Fold in saltines, vanilla, baking powder and pecans. Spread evenly into an ungreased 9 inch deep dish pie plate. Bake for 30 minutes in the preheated oven, or until a skewer inserted into the center comes out clean. Remove from the oven, and cool. The crust will puff and crack as it cools. When crust is completely cool, arrange sliced peaches over the top. Cover with aluminum foil to protect their color until serving. Top with sweetened whipped cream just before serving. Good if you don't beat the egg whites in a metal bowl. Otherwise you can taste the metal in the meringue. This pie was delicious, but I didn't know how to serve it. The slices would not come out like a normal pie. Best just spooned out. Very good, but there is too much sugar in the mergengue crust for my taste. I cut it by half.